On an old sheet or a large piece of paper, draw a design similar to that shown. Vary the choices as you like and add or delete choices as needed for the Scouts. Have each Scout in turn toss the bean bag or the penny onto the drawing. The Scout must pronounce the career and describe what that career does. Award points for each correct answer. The winner is the first Scout to reach a designated number of points. Create a playing area by setting up two 30’ long ropes (or tape or cones) on the ground parallel to each other. They should be a good distance apart. Divide the Scouts into three groups of about equal size. Group 2 stands in the middle. Group 3 stands on the outside of the other piece of rope. Group 1 tries to “send” this message to Group 3. Group 2 tries to interfere with the transmission of the message. Group 1 may only use verbal clues (i.e., many not write anything down) and may not cross the line. Give Group 1 about 20-30 seconds to plan a strategy of sending the message before the game starts. Once started, Group 1 has 20 seconds to transmit the saying. Group 2 waves hands, yells, anything they can so that the message does not get across. After 20 seconds, end the attempts. If Group 3 can repeat the message correctly, Groups 1 and 3 win. If Group 3 cannot repeat the message exactly, Group 2 wins. Rotate two additional times so every Scout gets to play in each position. This game is VERY loud. Have Scouts discuss what worked well and what didn’t. Ask - Isn’t it always true that there is some kind of interference going on whenever we try to communicate with others? This should not stop our attempts. Divide Scouts into teams and place in lines. Each Scout in line is a “car” and has something “wrong” with it. The Scouts first in line have a flat tire and can only hop on one leg. The Scouts second in line can’t go forward and have to go backwards. The Scouts third in line have broken steering wheels and must travel in a zigzag fashion. The next Scouts have “rusty transmissions” and have to take three steps forward and two backwards. The first team to get all their cars fixed wins. Each boy gets a “Space Ship” made by stapling or gluing two paper plates together. They each add a name and decorate their ship with markers. Each boy can describe where his ship would be heading if he grows up to be an Astronaut or Time Traveler. Boys take turns throwing their ship out into space and try to go through the circle made by bending a wire hanger into a circle and hanging it from a doorway. This could be a team game, with each team scoring a point each time one of their ships makes it through, or they can just have fun! There are lots of variations of this idea, but here is one from the American Museum of Natural History – Great fun, so make sure you have plenty of long balloons! 1. Inflate the balloon, but do not tie it. Instead, use the clothespin to clamp it shut securely. 2. Release the clothespin. What happened? 3. Reinflate the balloon and clamp it shut with the clothespin again. 4. Thread the string through the drinking straw. Tape the long side of the balloon along the length of the straw. 5. Either tape the ends to two opposite walls or have two people hold the ends. Whichever you do, make sure the string is taut. 6. Slide the balloon-straw assembly along the string until the clamped end reaches the wall or the end of the string held by a person. A rocket's movement depends on Newton's Third Law of Motion: For every action there is an equal and opposite reaction. When a rocket blows out gas at high speed in one direction (action), the rocket is pushed in the opposite direction (reaction). The gas pushes against the rocket and the rocket pushes back just as hard against the gas. The balloon works the same way as a rocket does. The compressed air (gas) inside the sealed balloon pushes outward in all directions, but as long as the gas can't go anywhere, neither can the balloon. As soon as you release the clothespin, the gas blows out the back at high speed (action). It pushes the balloon away in the opposite direction (reaction). A space rocket works in basically the same way as a balloon rocket except that a space rocket doesn't expel all the compressed gas at once. It burns fuel to resupply the compressed gas and keep the reaction going over a longer period of time. What one thing do you think will be different in 20 years? What kind of money do you think we will be using? Do you think we will still use wires or cords for electricity? Will people still use cell phones and computers, or do you have a different idea? Have each table or group report on what they decided. Divide boys into two or more teams. The leader calls out the name of a career; the first boy runs to the box and finds two items for that career. He removes the items and gives them to the next boy. The leader calls out another career. The second boy runs to the box, places the items from the first boy into the box, and takes out items for the second career. The game continues until every boy has run at least once. Prepare a list of different occupations and cut into slips. One at a time, boys or even parents come up, choose a slip and act out that occupation. If you divide into teams, it will be even more fun! Each family, den or individual gets a piece of paper and a pencil. They must list as many occupations as they can think of in a given time. 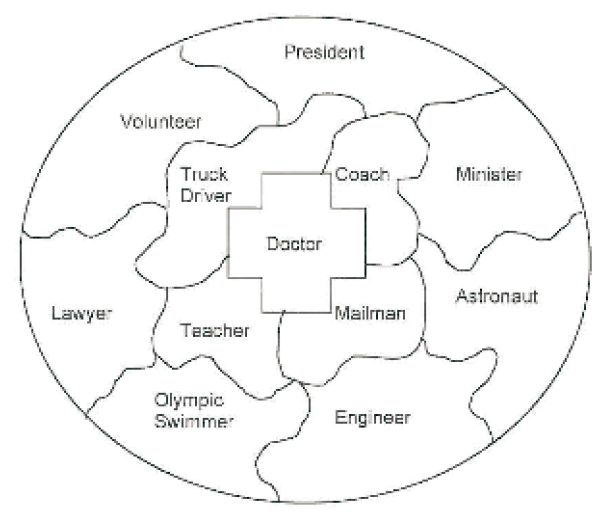 Pick four corners or spots and give each spot a name of a career (Engineer, Fire Fighter, Police Officer, Teacher). Place a sign in each corner with a picture of a person in the career for that corner. Gather the kids together and point out the four corners and their names. "It" stands in the middle of the area or room, covers his eyes, and counts to 20 while the other players run to the corners. Keeping his eyes closed, "It" calls out the name of a corner. Everyone in that corner is out of the game. "It" closes his eyes and counts again while the remaining boys all run to a corner again. The game continues until only one person is left who then becomes "It" for the next round. 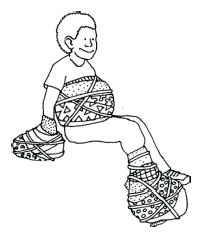 Materials – Tie several shoestrings together to form a circle. Have several sets of circles. Divide Scouts into teams so each team will have a shoestring circle. All the Scouts must use both hands to hold the shoestrings. The team is asked to form an equilateral triangle, or some other simple shape. However, no Scout may talk during the activity and everyone must continue to hold the shoestrings with both hands. Once successful, ask the Scouts to form other shapes. An alternative for the older Scouts would be to ask them to do this activity with their eyes closed. Equipment: A glove, a beanbag, a small rubber ball, or any other tossable object. The ‘buck’ is a small object that can be tossed easily from player to player - a glove, a beanbag, a rubber ball. Toss the buck to a player in the circle. The person catching the buck must begin to tell a story - something made up on the spot. The player holding the buck tosses it to another player who must catch it and continue the story. The story can take any form just as long as there is an attempt to connect it to the last player’s contribution. Players must not break the flow of the story no matter how fast the buck is passed. Those who have the buck must speak - if only a few words —and then they can toss it to another. Clear a large, open space in the room. Divide the group into two teams or into several small ones. Each team gets an equal pile of paper with which to build a tower. No other materials — no staplers, tape, or glue can be used to construct the tower. Papers should be folded to reinforce construction. The tighter the paper is folded, the stronger it gets but it also gets smaller. Loosely folded paper might provide large building elements, but the construction will be more fragile. 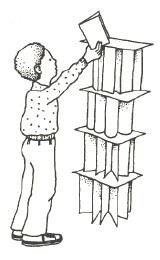 The team that builds the highest tower wins an award. Award citations, also, for the cleverest construction techniques and the most architecturally beautiful. Have the entire group work together to build the world’s largest paper building. For this game, collect as many fabric scraps as you can, the more the better. Push all the furniture to the corners of the room to create an open space. Place the fabric scraps and string in the center of the space. Have each person pick a body part to transform using fabric scraps. To get started, suggest that they can wrap and stuff fabric to create cone-heads, huge clown feet, great muscular arms, and fat stomachs. Fabric might be wrapped around limbs or tied on with string. Coats and jackets can be worn over new body shapes to complete the transformation. After these creatures have been created, organize a parade through the room. Each person selects a partner. One person becomes a blob of clay, and the other becomes the sculptor. The sculptor molds and forms the human clay into any shape possible without hurting the clay. Arms can be turned, legs can be bent, heads can be tipped, and faces can be pushed into strange expressions. The clay may resist any unreasonable positions. When the sculptor is finished, the creation may be put on exhibit. After the exhibit, sculptor and sculpture should switch places. Divide the entire group into smaller groups of five or six. One person in each group is selected as the sculptor and the others become the clay. The sculptor uses all the others, intertwining limbs and bodies, to form a single sculpture using the entire group as clay. Den members stand in a circle. The den chief starts the game by handing a balloon to the first boy. The Cub Scout holding the balloon then pops the balloon by sitting or stomping on it. He performs the indicated action. Formation: The Cubs sit in a circle. One Cub goes outside the room; while he is away the others decide what he should be when he comes back. If they decide on a policeman, for example, they call him back and he has to ask each Cub in turn what he has to buy for himself. One will say black boots, another a whistle, another a flashlight and so on. If the shopper goes right around the pack without guessing what he is, everyone tells him what he is, and then he picks someone else to go out of the room. Cub Scouts sit in chairs scattered around the room. Each is given the name of a planet - Venus, Saturn, Mars, Jupiter, Earth, etc. One boy is picked to be Mission Control. He stands and says “Countdown”... walking around the room, he calls out the names of various planets. When a Cub Scout hears the name of his planet, he gets up and walks behind Mission Control. When most of the Cub Scouts are out of their seats, Mission Control shouts “Blast Off’. At this, all Cub Scouts - those sitting and those following Mission Control - must find new seats. The last Cub Scout to find a seat is the new Mission Control. Players stand in a circle. One person volunteers to be the Farmer and is blindfolded. The Farmer spins around slowly in the circle and then points at someone and names any farm animal. The person who is pointed out makes the sound of the animal named, and the Farmer tries to identify who made the sound. If he is successful, the person named becomes the Farmer, and the old Farmer joins in the circle. Players who make farm sounds may disguise their voice any way they want to.